The fax machine has somehow managed to quietly cling to life. Until now. Fax machines continue to be used in offices around the world, despite a technological advancement — like, perhaps, email — that makes the 1980s staple almost entirely obsolete. Carrier pigeons, the telegram, clunky car phones, tape recorder answering machines, videocassette recorders, portable cassette players and CD players have all gone to the great technology graveyard in the sky. But the fax machine has somehow managed to quietly cling to life. Until now. On Sunday, the National Health Service, the public healthcare system in the United Kingdom, was ordered to pull the plug on its 8,000 fax machines by April 2020. The NHS has been called the owner of the world’s largest collections of fax machines. The fax machines will be phased out in favor of "modern communication methods, such as secure email, to improve patient safety and cyber security,” according to an announcement from Matt Hancock, the U.K.’s health and social care secretary. The news was, of course, met with plenty of jokes from Twitter users. While there will soon be 8,000 fewer fax machines making that grating beeping and humming sound, there are even more that are still being used around the United States. Last year, fax machine usage stayed the same or continued to grow in 82 percent of the large organizations surveyed by International Data Group. “Fax is a trusted method of secure information exchange,” the report said. But it also has been fraught with issues. A broken fax machine was blamed in April for keeping several people detained at New York’s Rikers Island jail. Part of the bail process involves sending details of the payment to the jail, via fax. But without a working machine, detainees were kept even longer, unless a loved one was actually able to visit the jail to bail them out in person. 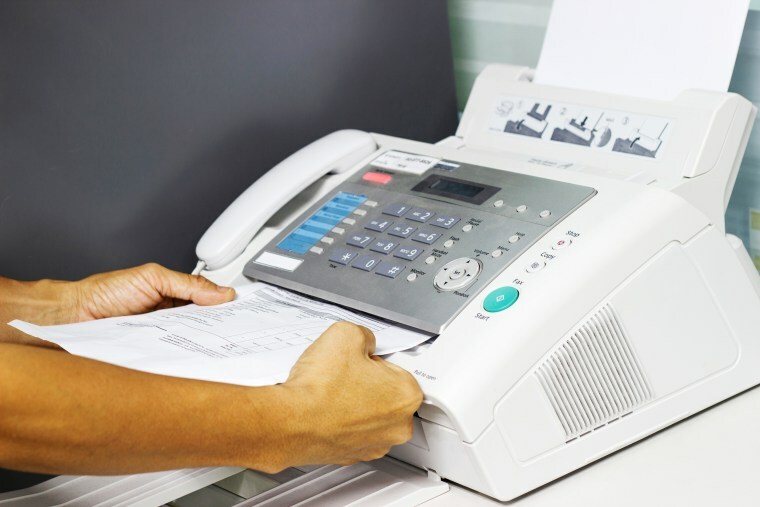 The fax machine is a staple in many medical offices, since providers are required by HIPAA to engage in “reasonable safeguards” when transmitting patient information. Even offices that have made the high-tech switch to apps and encrypted messaging still have a fax machine in the event they need to communicate with other medical professionals. A start-up trying to take the pain out of getting and sharing medical records also floundered. PatientBank, a service that allowed patients to store, share and search their medical records, negating the need for constant faxing, shut down in January after it “struggled to find a sustainable business model,” even after interacting with virtually every hospital in the United States, Paul Fletcher-Hill, CEO and co-founder, wrote in a blog post. But the rash of fax machines doesn’t end there. They are also a retro annoyance to journalists, who are often times required to use fax to submit freedom of information requests to government agencies. The other alternative is perhaps the only thing in the world that might make a fax seem more appealing — snail mail.